This post should considered as containing gifted content. Dyson invited me out to check out their newest innovations, and without knowing that I would be gifted something truly awesome, I still went 3 hours drive out of my way to check them out. So I'm declaring it as #gifted because awesome is awesome. 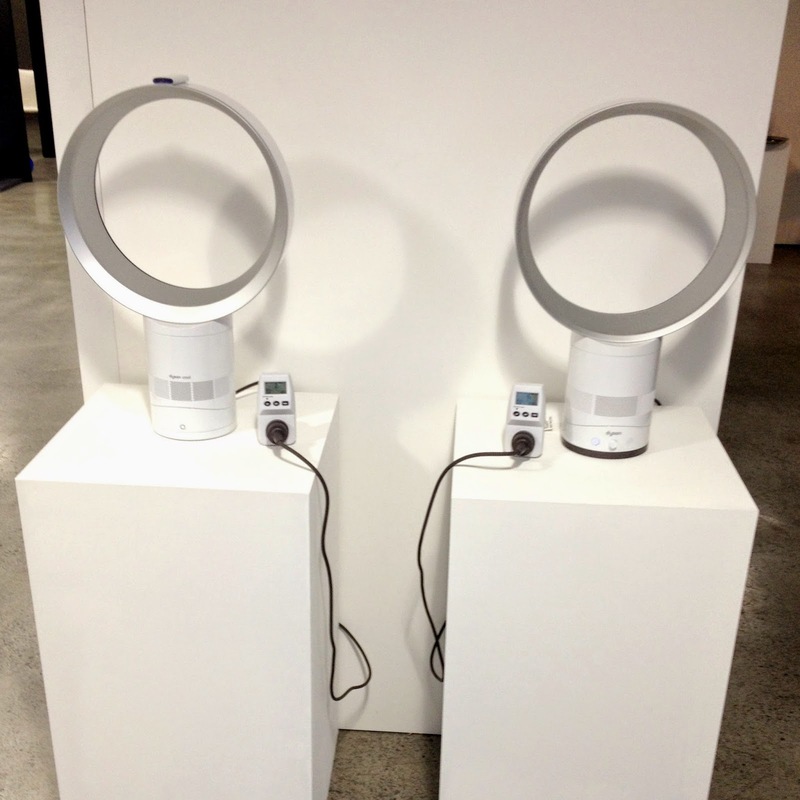 Have you ever walked past the cooling section in an electrical department or store and noticed the bladeless Dyson fans? You've not just noticed them, you've stopped, put your hand through and waved it around a little, just out of curiosity that it actually works. Maybe you've even been tempted to put your head through, and then had to restrain your children from putting their heads through. Oh wait, maybe that's just me. The Dyson brand has always seemed to me to be just that little bit ahead on the innovation stakes. 14 years ago when we were getting our first vacuum cleaner, we followed suit on my sisters purchase and bought a Dyson. Because they were indisputably the best. And also the most expensive. Lets not pretend. This is not a cheap brand, and while it may seem out of character for me to be buying a premium brand, my 14 year old Dyson is still going and has given us long term value. It's never given up, it still has powerful suction, and is still better than many of my friends newer, cheaper units. It's lost a few parts along the way thanks to some enthusiastic "helpers", and recently we upgraded to the new Dyson Animal. The old one has been garaged for now to hand down to 13 year old Madeleine when she gets her own place in 20 10 7(?) years. I digressed. From bladeless fan to vacuum without blinking. It was only a paragraph away before I started sharing my love for the Dyson Airblade hand dryers. I wandered into Sydney late on a Thursday night after work, not 100% sure what I was going to. Dyson HQ? A blogger event? A personalised tour? All of the above? 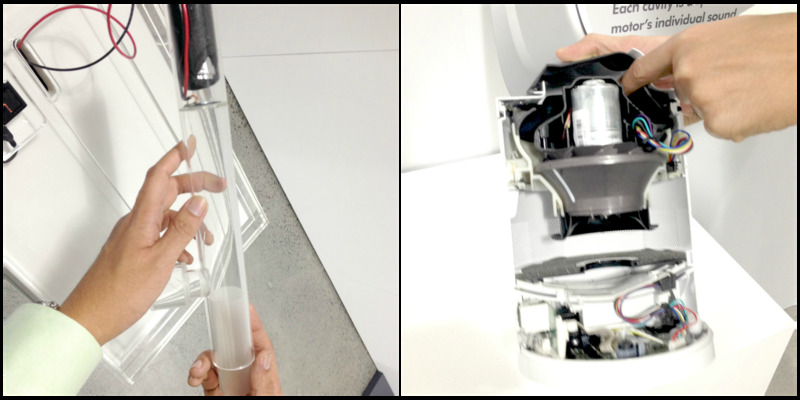 As it turns out, the good people at Dyson had set up an amazing showroom for their newest reveal, and brought one of their engineers out from overseas to share his new toy. Thomas is one of the engineers responsible for taking Dysons already terrific bladeless fan and making it more terrific than ever, as if that was possible. And yet it was. Some time ago, it was suggested that the sound of the bladeless fan was less than attractive. That surely a company as clever as Dyson could be doing better. And this is true, while the hum of the Dyson fan is not as choppy or even as loud as a standard fan that uses blades, there is still a noticeable sound. To some. Being all enthusiastic and eager to praise, I noticed a bladeless fan in the corner and complimented Thomas on how quiet it was. I could barely hear it so I was impressed. Turns out it wasn't the newest model. It was the noisy old one put out for conversation. I was then shown the new and old models side by side for comparison. The new model was turned on for me at it's highest speed, and it was lovely and quiet. I still couldn't really see the difference though from the one I had complimented a few minutes ago. It just wasn't that obvious because I was pretty impressed with the old model. Until they were turned on together side by side. Suddenly the old model sounded like an aircraft about to take off, and I couldn't imagine how on earth you would watch TV or enjoy conversation over that sound. It's insane the difference between them. New on the left, older model on the right. What intrigued me the most was the energy measurements attached to each model as well - the new model generates a significantly lower amount. 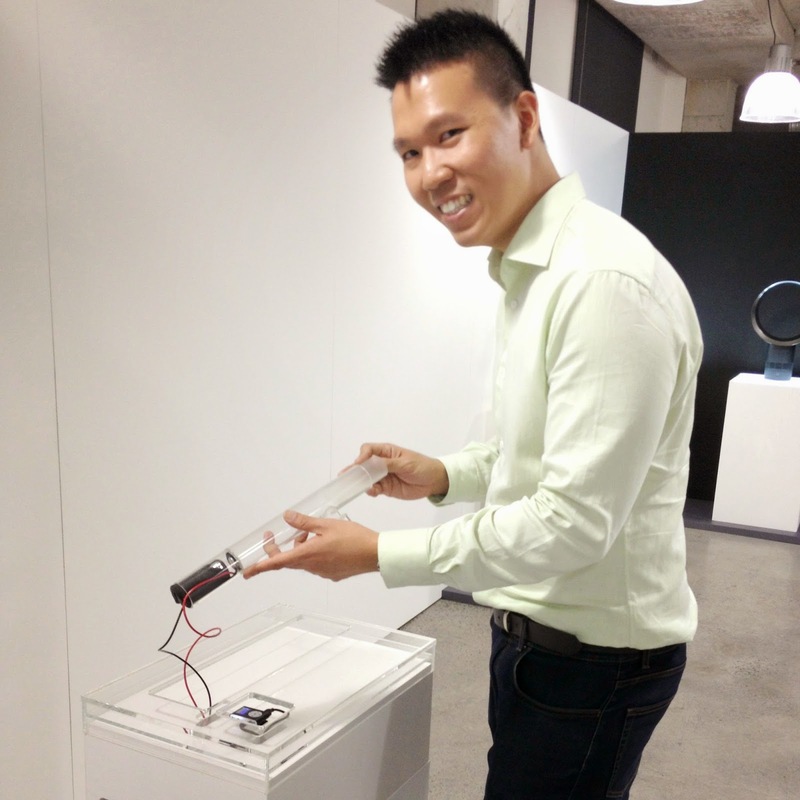 What followed was a little science demonstration, not unlike something you would expect to see at the Powerhouse Museum. 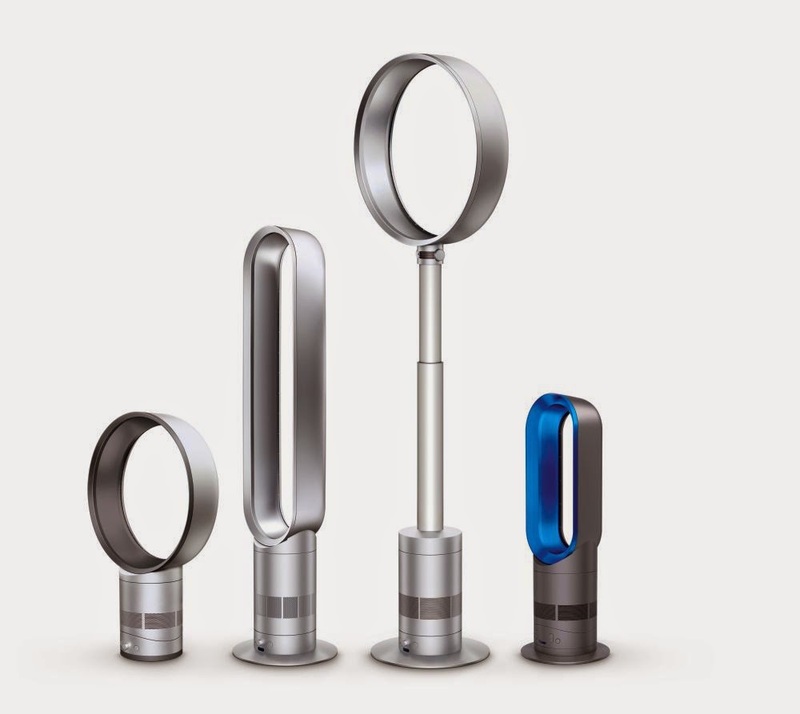 The goal that the Dyson engineers were working towards was to not just reduce the sound of their bladeless fan, but also to make the sound more pleasant. Lets face it, a fly isn't necessarily noisy, but the sound is still annoying! And so they designed a Helmholtz Cavity for each fan, which I'd love to explain, but I'm seriously not as clever as Thomas, so I'm going to sum it up by sound they basically divert sound into a little chamber. Dyson sent me home with a little gift - one of their new Dyson Cool fans for me to try out for myself. It took a week or two, but Mother Nature has sent us a delightful Spring, and we have had a lovely hot weekend. 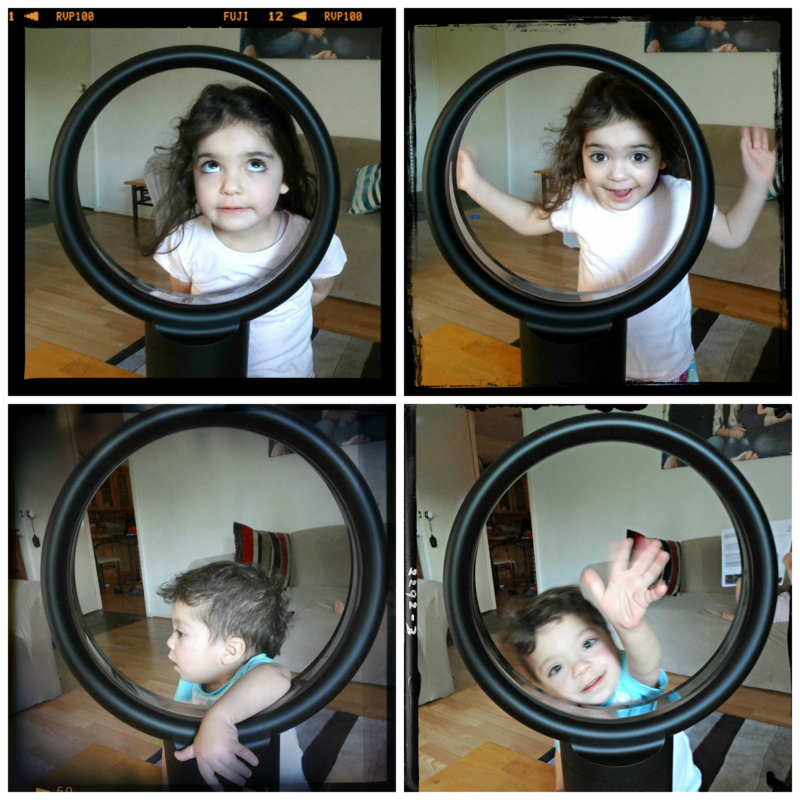 The kids wore short sleeves and bottoms for the first time in months, and we pulled out our new Dyson for a test run. Instant hit. Last summer, the one and only time we tried to use a regular fan we couldn't keep Lorelei from sticking her fingers through the cage and in a panic I put the fan away in the garage lest my curious toddler lose a finger. No such problems with this baby! Both little ones were fascinated with it, but their curiosity couldn't hurt them. Between feeling the breeze, and poking their heads and arms through to figure out where it came from the new fan was a hit. Husband and I love it, it's safe, quiet, and chews up only a small amount of energy. The clever new models come with a remote control that sits comfortably on top of the unit, with lightly clinging magnets. The air flow can be increased or reduced, and can be felt across the room. I'm also liking the way I can tilt the fan forward or back to redirect the flow. While this one is great for our enclosed front lounge room, we think the taller pedestal model would be a better fit for our larger open plan family room. It's the next best thing to owning one of the Dyson Airblade hand dryers. Which I'll happily review if they ever send one my way. Great review Elise! We are about to do the same on e the weather warms up a bit more! It's truly a nifty little appliance isn't it? I've seen one before, but never walked up to it and really checked it out. Amazing bit of ingenuity. I didn't know Dyson did anything apart from vacuum cleaners! I love the fact that it's a fan without blades! How clever is that? I want to see one up close though to work out how it works.